• Two channels in a single unit saves space and reduces costs . • Signal splitter model (633T) provides two identical isolated outputs from one input signal . • Built-in isolated excitation supply with short circuit protection can drive up to two field 2-wire process loops . • Full isolation safely separates each input channel, each output channel, the excitation supply, and power . • Excellent accuracy and stability ensure reliable operation in hostile environments . 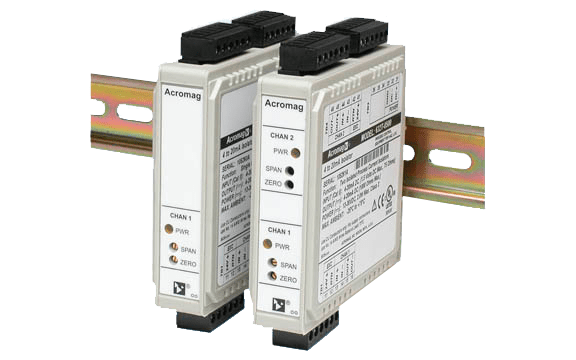 • Low input burden keeps voltage drop to less than 1 .5V for full-scale current . • Supports wide 0 to 1000 ohm load range and no trimming is required if the load varies . • Current limiting safely limits output to 27mA . • Pluggable terminals, zero/span trim pots and power LEDs make installation, maintenance, and long term service easy . – Voltage drop (631T, 632T): Less than 1 .5V (75 ohms) at full scale . – Voltage drop (633T): Less than 3 .0V (150 ohms) at full scale . – Bipolar Transient Voltage Suppressors (TVS) . – 24V DC ±10%, 22mA maximum each .Fully isolated . Includes independent current limiting at EXC1 and EXC2 near 23mA, each . – Zero and full-scale adjustment to ±4% . – Outputs are limited to 27mA . – 0 to 1000 ohms (631T) . – 0 to 950 ohms (632T, 633T) . – Less than ±0 .01% of output span effect for a ±100 ohm change in load resistance . – 25mS typical to 98% of final output value . – ±0 .05% of output span .Error includes the combined effects of isolator repeatability, hysteresis, terminal point linearity and adjustment resolution . – Better than ±50ppm/°C (±0 .005%/°C) over the ambient temperature range .This specification includes the combined effects of zero and span over temperature . – -3dB at 50Hz, typical with a 500 ohm load . – Common mode: Better than 100dB at 60Hz, typical . – Normal mode: -6dB at 60Hz, typical, 500 ohm load . – Green, one LED per output channel . – Constant ON indicates power applied . – DC-powered units: 15-36V DC SELV . – 631T: 1 .5 watts without excitation, 2 .4 watts with excitation . – 632T, 633T: 3 .0 watts without excitation, 4 .8 watts with excitation . – DC off ground, on a continuous basis (will withstand 1500V AC dielectric strength test for one minute without breakdown) . – Less than ±0 .25% of output span effect under the influence of electromagnetic fields from switching solenoids, commutator motors, and drill motors . – 4KV direct contact and 8KV air-discharge to the enclosure port per EN61000-4-2 . – 10V/M, 80 to 1000MHz AM and 900MHz keyed carrier, per EN61000-4-3 and ENV50204 . – 2KV to power and 1KV to signal I/O per EN61000-4-4 . – 10Vrms, 150KHz to 80MHz, per EN61000-4-6 . – 0 .5KV per EN61000-4-5 . – 30 to 1000MHz per EN55022 Class B . 19” rack-mount kit with DIN rail .